Manager Jackie McNamara was delighted to see Dundee United bounce back from a heavy defeat to win 1-0 at Motherwell. 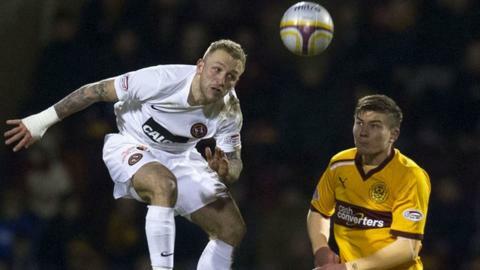 Johnny Russell scored the only goal at Fir Park, following a 6-2 thumping at Celtic Park on Saturday. "It's a massive three points for us especially after Saturday," explained McNamara. "Motherwell have some good players who can hurt you. However, our keeper didn't have many saves to make while theirs was man of the match." Gary Mackay-Steven, who set up Russell to score on 17 minutes, turned in an excellent performance and will consider himself unfortunate not to have got on the scoresheet. Motherwell keeper Darren Randolph pulled of a string of fine saves to thwart the tricky midfielder, while Russell and skipper Jon Daly, who was shifted into defence, also went close to adding to the visitors' tally. "I thought we defended well as a team," explained McNamara. "I said to the lads before the game that clean-sheets will win you games, we have to make sure we defend well as a team. "Big Jon Daly went in there and was solid and Richie Ryan did a good job of protecting the back four. "Motherwell had good possession but I always thought we looked dangerous and that we could go and score goals. "I could have done with another couple just to ease the nerves towards the end. Mackay-Steven's performance eclipsed the return of James McFadden for the home side and McNamara is thrilled to have such a talent at his disposal. "That's why people come to watch football; to see the likes of Gary Mackay-Steven and Johnny Russell and Stuart Armstrong as well - he is a fantastic talent; that lad has got everything. "All three are quick and, for the goal, Gary was strong and held them off before his pass through to Johnny, which had excellent weight on it."